While dogs may wag their tails furiously as a sign of greeting and excitement, cats have more nuanced—but no less expressive—body language. Unlike their canine counterparts, felines have more complicated gestures, and oftentimes pet parents find it difficult to decode their cats’ feelings. In particular, many pet parents may speculate about the meanings of a cat’s tail wags. “Cats have very expressive tails, so tail position and movement can tell us a number of things,” said Dr. Eloise Bright, a veterinarian based in North Ryde, Australia. Of course, tail movements are only one piece of the body-language puzzle. Other important physical signs to note include everything from posture and facial expressions to the position of the ears and tail. These six tail movements, deconstructed, may assist in deciphering your cat’s body language and guide you in determining if your cat is ready to cuddle or if you should back off. Ever have kitty wrap its tail around your hand, arm, or neck? “Cats will often wrap their tails around the leg or arm of an owner to show affection, but head butting is more commonly used,” Donohue said. Whether it’s a friendly tail-wrap or clunk on the arm from their head, this is often an overt sign of a cat’s love. Not to be mistaken for a quiver, the low tail flick is a fairly obvious movement. 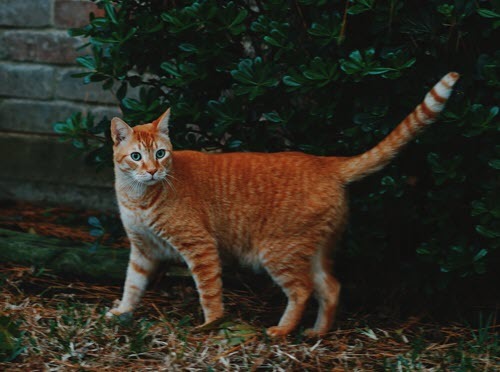 A feline will hold its tail low, extended rigidly, and flick it back and forth, indicating its displeasure, according to Dr. Bright. The low flick can also be indicative of an upset cat that is ready to pounce, Donohue said, and is often used when a cat stalks airborne prey. Different from the tail flick, the swish usually means your cat is about to pounce on your hand, normally a more playful manner and mood, according to Dr. Bright. “If your cat is the type to ambush your ankles when in a feisty mood, throw a toy as a decoy when you see that tail swish,” she said. If confronted by another animal or anything a cat considers to be a danger, it’s common to witness a fluffed-up tail. The fluffed tail, particularly if combined with an arched back, is used in response to a threat, Dr. Bright said, and is used to make the cat look bigger and scarier to its nemesis. If you ever notice your cat gazing from the window intently, it’s possible it may be accompanied by a slight twitch in the end of the tail. This can signify interest or concentration on something, according to Dr. Bright.